The truth is these coins are so few in number today that the price for a single coin is a small fortune. I found just two for sale on the Internet. Both were Mormon $5 gold pieces; the first was accepting bids, the second had an asking price of $47,500. For any treasure hunter finding just one of these coins would be a jackpot! 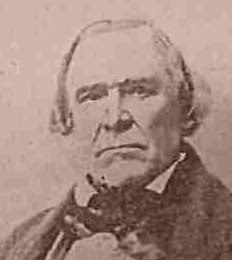 After settling in the Valley of the Great Salt Lake in 1847, the Mormons used the Barter system and paper script issued by the church in trade. But, after gold was discovered in California in 1848, the need for a medium of exchange that was accepted beyond the influence of the Mormon Church became clear. Widespread melting occurred in the 19th century after the federal government outlawed privately minted money. 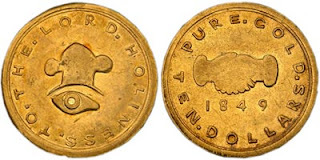 Because of their faith in Church-minted gold, Mormon settlers cached much of these coins with the uncertainty caused by the approach of the Civil War. Many coins were lost in public places, such as stores, saloons, stables, picnic areas and rodeo grounds. 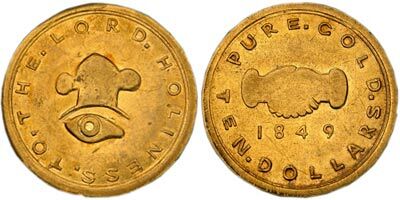 So many of these coins were sent back east that, by 1851, Brigham Young declared that not a single gold coin could be found in Salt Lake City. Regardless of what happened to them, if you’re lucky enough to find one today I’d hang on to it very closely. With a good detector you might want to consider a trip to visit Utah. The last Mormon gold piece found was in 1909 before the advent of the metal detector. Thompson, George A, “Missing Gold Coins Worth Up To $6,500 Each!” May 1972, Treasure World, p. 36.